May is the month of Mary. That got me thinking about a Marian feast which we celebrate not in May, but in March -- the Solemnity of the Annunciation. Those who’ve been to Israel, know that in Nazareth, in the Church of the Annunciation, the place where reportedly the Angel Gabriel appeared to Mary, in the lower chapel, there is an inscription that says, Verbum Caro Hic Factum Est -- "Here, the Word was made Flesh.” I know this, because I’ve been told – because when I went to Nazareth, we didn’t go to the Church of the Annunciation. In fact we weren’t even supposed to go to Nazareth. We were going to the little town of Reneh, which is just outside of Nazareth and we were going to bypass Nazareth, but we took a wrong turn, so we ended up driving all the way through Nazareth traffic and found ourselves, on a hill on the north side of the town when our guide points out the window and says, “See that dome over there? That’s the Church of the Annunciation.” It was very far away, on another hill, behind some buildings and trees. It was a nice surprise to see the Church. Because I didn’t expect to even see it. This is where the Word was made flesh. This is where it all happened. In many ways, the March 25th feast should be called “the Feast of the Incarnation.” It's not really a "Mary" feast. And that's what I'm thinking: When we celebrate Mary, we're really celebrating Christ. And with the Feast of the Annunciation, in March we are in the middle of Lent, but we're celebrating a little bit of Christmas. In fact, maybe it's even a bigger feast than Christmas. It's on that day that God meets man; heaven meets earth; the divine meets the human. But, in a way, it was good that I didn’t go to the Church, because, for me, it would have been distracting from a very important reality about our God: God is not a God that lives far away, sitting in a throne somewhere, making up rules. He’s not even just a “creator” God – like the God of the first chapter of Genesis. God is a God who walks with us – like the God of the second chapter of Genesis: who walks in the garden with us – the God who journeys with the people of Israel through the desert – the God whom Moses speaks to face to face. Our God is the God that Isaiah talks about in the first reading on the Solemnity of the Annunciation (Isaiah 7:10-14, 8:10d): Emmanuel, God-with-us. God is a God who is made flesh and dwells among us. But a very big part of this “enfleshing” doesn’t just happen two thousand years ago in a little insignificant village in northern Galilee. God is made flesh right here, right now, every day. God was made flesh in the proclamation of the Word from every pulpit today. God is made flesh when we celebrate the Eucharist. God will dwell in us when we receive Him in Communion. God is made flesh in our families: in my children and in my wife, in the love we share, in our marriage. God is made flesh when we experience new life. God is made flesh in our schools, with every new idea and promise of a future – God is also made flesh in our work here at SL – in the programs that we make – the documentaries – every time we share the good news, God dwells among us. God dwells among us right here, outside our office in the men and women who seek help at the Salvation Army or the men who look for help at the Good Shepherd Refuge down the street, because they cannot get out of a cycle of addiction or they can’t cope because of a mental health issue. God is made flesh everyday and all the time. And not only do we not say yes like Mary – but we don’t even notice. If I was to make a movie about the Annunciation, I wouldn’t have Gabriel appearing in a bright light, with wings and long flowing blond hair. I would have Mary walking everyday through the market over to the well to get water. And every day she passes by the village beggar – a blind man. Everyone knows him; he’s been there forever. He knows everyone, even Mary. He always knows it’s her when she passes by. And every day she passes him, he says, “Hi Mary.” But she never responds – because even though her parents have taught her to be compassionate to those who are less fortunate, she’s still a bit creeped out. She is only 13, afterall. He says hello to her and she quickens her pace to walk past him. But on this day, THIS day, it is extra hot and as Mary is passing by on the way home, she hears him say softly, “can I please have some water?” Mary stops, unsure as to how to respond. There is no one else around. The beggar says, “Do not be afraid.” Mary hears gentleness in his voice and with a shaky hand, offers him a bit of water. The beggar, whose name is Gabriel (and was God’s messenger all along) says, “You are full of grace... the Lord is with you… you who’ve cooperated with God’s Grace…” and proceeds to share with her the Good News. Perhaps this is not very scriptural, but it would help me remember that this Incarnation did not only take place a long time ago in a faraway place, but takes place here and now. It will remind me that God is Emmanuel: God-with-us – and longs to dwell in my heart. All I have to do is pay attention so that I can say, “Here I am Lord, I come to do your will,” to say “yes,” just like Mary did. 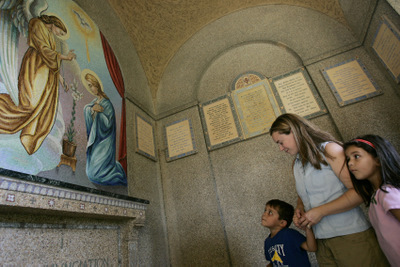 CNS photo/Paul Haring: A mother stops with her children to look at an outdoor mosaic of the Annunciation at the Franciscan Monastery in Washington, D.C.